Madrid is one of the liveliest cities in the world. "Madrid never sleeps"!. At night the more glamorous locals, pubs with all kinds of music, discos and clubs open their doors. And stay open until the wee hours of the morning, any day of the week. So the locals are known as cats ("gatos"). Everything is here: restaurants, bars, pubs, discos, flamenco and more. And at the end of the night do not forget to take some "churros" with chocolate, typical after a long night of partying. 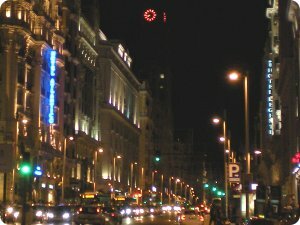 It is the liveliest and most popular entertainment district in Madrid. There's a large variety of bars, pubs and clubs offering a diverse selection of music. Huertas is the preferred destination for tourists. The neighborhood encompasses the Plaza de Santa Ana, and stretches from Cruz Street to Huertas Street, and its parallel streets (it's only steps from the Puerta del Sol). Most of the establishments close around 3:00 AM, but there are some discos that stay open longer. It is situated between the Gran Vía Avenue, and the streets of San Bernardo, Fuencarral and the Glorieta de Bilbao. Also known as Maravillas district. It is known for its alternative and bohemian atmosphere. The type of music most predominant: rock, punk and indie-pop. Normally, the pubs here are small capacity. Chueca is the gay neighborhood in Madrid. Located near the Gran Vía Avenue, between the streets of Fuencarral and Barquillo, and Plaza de Chueca, is the most fashionable district. 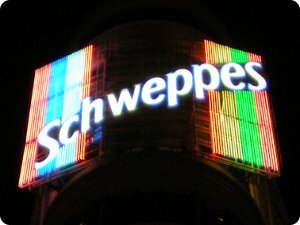 In this neighborhood is celebrated, in late June, Gay Pride Day, with a famous parade along the Gran Vía Avenue. This is the entertainment area preferred by young people and students, due to its proximity to a lot of colleges and student halls of residence. It's located primarily in the Plaza de la Moncloa. There are many bars, pubs and nightclubs in different styles: rock, techno and pop (especially, Spanish pop). The Salamanca neighborhood is bounded by the Paseo de la Castellana and the streets of Alcalá, María de Molina and Francisco Silvela. Predominantly commercial music, dance and house. There are great nightclubs frequented by high purchasing people. La Latina is located in the center of Madrid, near the Plaza Mayor. It runs mainly between the squares of the Plaza de la Cebada and Plaza de la Paja, where there are many restaurants, bars and pubs. Near the Santiago Bernabéu stadium. It is a space between the Paseo de la Castellana, Orense street and Brasil Avenue. In the basement of large buildings (as Europa Tower) we can find pubs, clubs and nightlife. • Kapital is one of the favorite by the travelers to Madrid. It is built in an old theater and has seven floors with different environments. It is located on Atocha Street, 125. • Joy Eslava. Open daily. It is located on Arenal Street, 11 (near the Puerta del Sol). • The Riviera is one of the oldest discos. With two areas with the best music. It is located on Paseo Bajo de la Virgen del Puerto, s/n. • Serrano 41 is one of the most glamorous clubs. In Serrano street, 41. Other classic clubs that have the same style as this are Moma (in José Abascal street, 56) or Gabana (in Velázquez street, 6). • Pacha. Open Wednesday to Saturday and eve of public holidays. In Barceló street, 11. • Bangaloo, besides house music and the diversity of environments, also has restaurant. Located on Avenida General Perón, 29.